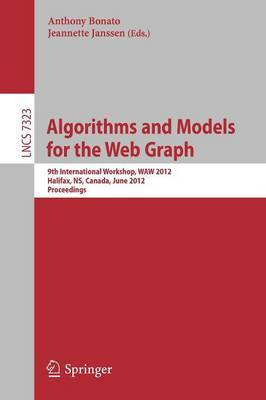 This book constitutes the refereed proceedings of the 9th International Workshop on Algorithms and Models for the Web-Graph, WAW 2012, held in Halifax, Nova Scotia, Canada, in June 2012. The 13 papers presented were carefully reviewed and selected for inclusion in this volume. They address a number of topics related to the complex networks such hypergraph coloring games and voter models; algorithms for detecting nodes with large degrees; random Appolonian networks; and a sublinear algorithm for Pagerank computations.